For other uses, see Jester (disambiguation). Hinric Hasenberger, the Court Jester by David Klöcker Ehrenstrahl, 1652. A jester, court jester, or fool, was historically an entertainer during the medieval and Renaissance eras who was a member of the household of a nobleman or a monarch employed to entertain him and his guests. A jester was also an itinerant performer who entertained common folk at fairs and markets. Jesters are also modern-day entertainers who resemble their historical counterparts. Jesters in medieval times are often thought to have worn brightly coloured clothes and eccentric hats in a motley pattern and their modern counterparts usually mimic this costume. Jesters entertained with a wide variety of skills: principal among them were song, music, and storytelling, but many also employed acrobatics, juggling, telling jokes, and magic tricks. Much of the entertainment was performed in a comic style and many jesters made contemporary jokes in word or song about people or events well known to their audiences. The modern use of the English word jester did not come into use until the mid-16th century, during Tudor times. This modern term derives from the older form gestour, or jestour, originally from Anglo-Norman (French) meaning storyteller or minstrel. Other earlier terms included fol, disour, and bourder. These terms described entertainers who differed in their skills and performances but who all shared many similarities in their role as comedic performers for their audiences. Early jesters were popular in Ancient Egypt, and entertained Egyptian pharaohs. The ancient Romans had a tradition of professional jesters, called balatrones. Balatrones were paid for their jests, and the tables of the wealthy were generally open to them for the sake of the amusement they afforded. Jesters were popular with the Aztec people in the 14th to 16th centuries. Many royal courts throughout English royal history employed entertainers and most had professional fools, sometimes called licensed fools. Entertainment included music, storytelling, and physical comedy. It has also been suggested they performed acrobatics and juggling. Henry VIII of England employed a jester named Will Sommers. During the reigns of Elizabeth I and James I of England, William Shakespeare wrote his plays and performed with his theatre company the Lord Chamberlain's Men (later called the King's Men). Clowns and jesters were featured in Shakespeare's plays, and the company's expert on jesting was Robert Armin, author of the book Fooled upon Foole. In Shakespeare's Twelfth Night, Feste the jester is described as "wise enough to play the fool". King James VI of Scotland employed a jester called Archibald Armstrong. During his lifetime Armstrong was given great honours at court. He was eventually thrown out of the King's employment when he over-reached and insulted too many influential people. Even after his disgrace, books telling of his jests were sold in London streets. He held some influence at court still in the reign of Charles I and estates of land in Ireland. Charles later employed a jester called Jeffrey Hudson who was very popular and loyal. Jeffrey Hudson had the title of Royal Dwarf because he was short of stature. One of his jests was to be presented hidden in a giant pie from which he would leap out. Hudson fought on the Royalist side in the English Civil War. A third jester associated with Charles I was called Muckle John. Portrait of the Ferrara Court Jester Gonella by Jean Fouquet 1445. Scholar David Carlyon has cast doubt on the "daring political jester", calling historical tales "apocryphal", and concluding that "popular culture embraces a sentimental image of the clown; writers reproduce that sentimentality in the jester, and academics in the Trickster", but it "falters as analysis". Jesters could also give bad news to the King that no one else would dare deliver. In 1340, when the French fleet was destroyed at the Battle of Sluys by the English. Phillippe VI's jester told him the English sailors "don't even have the guts to jump into the water like our brave French". After the Restoration, Charles II did not reinstate the tradition of the court jester, but he did greatly patronize the theatre and proto-music hall entertainments, especially favouring the work of Thomas Killigrew. Though Killigrew was not officially a jester, Samuel Pepys in his famous diary does call Killigrew "The King's fool and jester, with the power to mock and revile even the most prominent without penalty" (12 February 1668). The last British nobles to keep jesters were the Queen Mother's family, the Bowes-Lyons. In the 18th century, jesters had died out except in Russia, Spain and Germany. In France and Italy, travelling groups of jesters performed plays featuring stylized characters in a form of theatre called the commedia dell'arte. A version of this passed into British folk tradition in the form of a puppet show, Punch and Judy. In France the tradition of the court jester ended with the French Revolution. In 1968, the Canada Council awarded a $3,500 grant to Joachim Foikis of Vancouver "to revive the ancient and time-honoured tradition of town fool". In the 21st century, the jester is still seen at medieval-style fairs and pageants. In 2015, the town of Conwy in North Wales appointed Russel Erwood (aka Erwyd le Fol) as the official resident jester of the town and its people, a post that had been vacant since 1295. 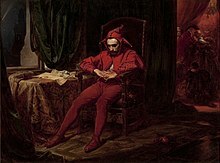 The Polish jester is the only person at a 1514 royal ball troubled by the news that the Russians have captured Smolensk. Poland's most famous court jester was Stańczyk, whose jokes were usually related to political matters, and who later became a historical symbol for Poles. In 2004 English Heritage appointed Nigel Roder ("Kester the Jester") as the State Jester for England, the first since Muckle John 355 years previously. However, following an objection by the National Guild of Jesters, English Heritage accepted they were not authorised to grant such a title. Roder was succeeded as "Heritage Jester" by Pete Cooper ("Peterkin the Fool"). In Germany, Till Eulenspiegel is a folkloric hero dating back to medieval times and ruling each year over Fasching or Carnival time, mocking politicians and public figures of power and authority with political satire like a modern-day court jester. He holds a mirror to make us aware of our times (Zeitgeist), and his sceptre, his "bauble" or marotte, is the symbol of his power. In 17th century Spain, little people, often with deformities, were employed as buffoons to entertain the king and his family, especially the children. In Velázquez's painting Las Meninas two dwarfs are included: Mari Bárbola a female dwarf from Germany with hydrocephalus, and Nicolasito Portusato from Italy. Mari Bárbola can also be seen in a later portrait of princess Margarita Teresa in mourning by Juan Bautista Martinez del Mazo. There are other paintings by Velázquez that include court dwarves such as Prince Balthasar Charles With a Dwarf. In Japan from the 13th to 18th centuries, the taikomochi, a kind of male geisha, attended the feudal lords (daimyōs). They entertained mostly through dancing and storytelling, and were at times counted on for strategic advice. By the 16th century they fought alongside their lord in battle in addition to their other duties. 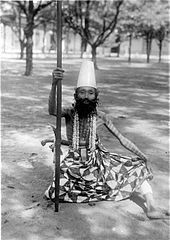 Tonga was the first royal court to appoint a court jester in the 20th century; Taufa'ahau Tupou IV, the King of Tonga, appointed JD Bogdanoff to that role in 1999. Bogdanoff was later embroiled in a financial scandal. The root of the word "fool" is from the Latin follis, which means "bag of wind" or bellows or that which contains air or breath. In Tarot, "The Fool" is a card of the Major Arcana. The tarot depiction of the Fool includes a man (or less often, a woman) juggling unconcernedly or otherwise distracted, often with a dog or cat at his heels. The fool is in the act of unknowingly walking off the edge of a cliff, precipice or other high place. (compare: Joker (playing card)). In literature, the jester is symbolic of common sense and of honesty, notably in King Lear, where the court jester is a character used for insight and advice on the part of the monarch, taking advantage of his license to mock and speak freely to dispense frank observations and highlight the folly of his monarch. This presents a clashing irony as a greater man could dispense the same advice and find himself being detained in the dungeons or even executed. Only as the lowliest member of the court can the jester be the monarch's most useful adviser. Author Alan Gordon also writes about jesters as advisers to the king, who actually make up a super-secret spy ring that try to keep peace and control the leaders of different countries. The Fool's Guild of these novels is portrayed as a mockery to the church, and they refer to Jesus Christ as "Their Savior, The First Fool". The Shakespearean fool is a recurring character type in the works of William Shakespeare. Shakespearean fools are usually clever peasants or commoners that use their wits to outdo people of higher social standing. In this sense, they are very similar to the real fools, and jesters of the time, but their characteristics are greatly heightened for theatrical effect. The "groundlings" (theatre-goers who were too poor to pay for seats and thus stood on the 'ground' in the front by the stage) that frequented the Globe Theatre were more likely to be drawn to these Shakespearean fools. However they were also favoured by the nobility. Most notably, Queen Elizabeth I was a great admirer of the popular actor who portrayed fools, Richard Tarlton. For Shakespeare himself, however, actor Robert Armin may have proved vital to the cultivation of the fool character in his many plays. American lawyer and politician Roscoe Conkling depicted as a jester in an 1884 cartoon. In a similar vein, a buffoon is someone who provides amusement through inappropriate appearance or behavior. The term originates from the old Italian "buffare", meaning to puff out one's cheeks that also applies to bouffon. Today, the jester is portrayed in different formats of medieval reenactment and entertainment, including film, stage performance, and carnival. During the Burgundian and the Rhenish carnival, cabaret performances in local dialect are held. In Brabant this person is called a "tonpraoter" or "sauwelaar", and is actually in or on a barrel. In Limburg they are named "buuttereedner" or "buutteredner" and in Zeeland they are called an "ouwoer". They all perform a cabaret speech in dialect, during which many current issues are reviewed. Often there are local situations and celebrities from local and regional politics who are mocked, ridiculed and insulted. The "Tonpraoter" or "Buuttereedner" may be considered successors of the jesters. Tom le Fol (c. 13th century) was the 1st resident jester of Conwy, North Wales and personal jester to Edward I.
Triboulet (1479–1536), court jester of Kings Louis XII and Francis I of France. Stańczyk (c. 1480–1560), Polish jester. João de Sá Panasco (fl. 1524-1567), African court jester of King John III of Portugal, eventually elevated to gentleman courtier of the Royal Household and Knight of St. James. Will Sommers (died 1560), court jester of King Henry VIII of England. Chicot (c. 1540–1591), court jester of King Henry III of France. Archibald Armstrong (died 1672), jester of King James I of England. Jeffrey Hudson (1619–c. 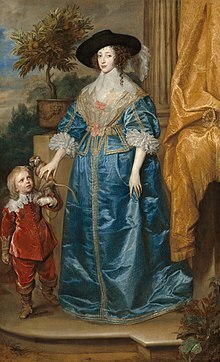 1682), "court dwarf" of Henrietta Maria of France. Jamie Fleeman (1713–1778), the Laird of Udny's Fool. Perkeo of Heidelberg, 18th century, jester of Prince Charles III Philip, Elector Palatine. ^ a b Soutworth, John (1998). Fools and Jesters at the English Court. Stroud: Sutton Publishing. pp. 89–93. ISBN 0-7509-1773-3. ^ Welsford, Enid (1935). The Fool: His Social & Literary History. London: Faber & Faber. pp. 114–115. ^ "Jester". Online Etymology Dictionary. Retrieved 28 October 2012. ^ "Jester". Encyclopædia Britannica. Retrieved 2012-06-07. ^ Carlyon, D. (2002). "The Trickster as Academic Comfort Food". The Journal of American Culture. 25 (1–2): 14–18. doi:10.1111/1542-734X.00003. ^ Otto, Beatrice K (2001). Fools Are Everywhere: The Court Jester Around the World. University of Chicago Press. p. 113. ^ "The Corpus Christi Caller-Times". Corpus Christi, Texas. May 14, 1968. p. 19. ^ "Northumberland needs county jester to lighten up politics". Archived from the original on Sep 28, 2007. ^ "Welsh town appoints first official jester in 700 years". NY Daily News. Archived from the original on 2018-10-11. Retrieved 2016-10-14. ^ Day, Liz (2015-08-08). "This official town jester can balance a flaming barbecue on his head..!". walesonline. Retrieved 2016-10-14. ^ Janusz Pelc; Paulina Buchwald-Pelcowa; Barbara Otwinowska (1989). Jan Kochanowski 1584-1984: epoka, twórczość, recepcja (in Polish). Lublin: Instytut Badań Literackich, Polska Akademia Nauk. Wydawnictwo Lubelskie. pp. 425–438. ISBN 978-83-222-0473-3. ^ Jan Zygmunt Jakubowski, ed. (1959). "Przegląd humanistyczny" (in Polish). 3. Warsaw: Państwowe Wydawnictwo Naukowe: 200. ^ "Jesters joust for historic role". BBC News. 2004-08-08. Retrieved 2010-05-06. ^ Griffiths, Emma (2004-12-23). "England | Jesters get serious in name row". BBC News. Retrieved 2012-07-11. ^ "England | Jester completes 100-mile tribute". BBC News. 2006-08-09. Retrieved 2012-07-11. ^ "Tonga royal decree appointing JD Bogdanoff as court jester" (JPEG). Retrieved 2009-10-29. ^ "Tongan court jester faces trial". BBC News. 11 August 2003. Retrieved 2009-10-29. ^ "Online Etymology Dictionary". www.etymonline.com. Retrieved 2017-03-30. ^ The fools of Shakespeare: an ... - Frederick B. Warde - Google Boeken. Books.google.com. Retrieved 2011-12-24. ^ "History of the Fool". Foolsforhire.com. Retrieved 2011-12-24. ^ Encyclopædia Britannica; or A Dictionary of Arts, Sciences, and Miscellaneous Literature, Volume 4. Archibald Constable and Company. 1823. p. 780. ^ Home Kalender Nieuws Zoekertjes Albums Copyright. "Wat is carnaval? | Fen Vlaanderen". Fenvlaanderen.be. Retrieved 2014-01-23. ^ "Conwy jester to take new job 'seriously'". BBC News. 2015-07-16. Retrieved 2016-10-14. ^ "No joke - Welsh town gets its own official jester!". ITV News. Retrieved 2016-10-14. ^ MacGuill, Dan. "A Welsh town has just appointed its first resident jester in 700 years". TheJournal.ie. Retrieved 2016-10-14. ^ Hemming, Jez (2015-07-15). "Official jester to be hired by Conwy council". northwales. Retrieved 2016-10-14. ^ "Bristol juggler to become North Wales town's first official jester in 700 years". Bristol Post. 2015-07-19. Retrieved 2016-10-14. ^ "British town appoints first jester in 700 years". The Japan Times Online. 2015-08-05. ISSN 0447-5763. Retrieved 2016-10-14. ^ Editor, Kira Brekke; Video, HuffPost (2015-08-05). "Welsh Castle Appoints First Jester Since 13th Century". The Huffington Post. Retrieved 2016-10-14. Janik, Vicki K. (ed.) (1998). Fools and Jesters in Literature, Art, and History: A Bio-bibliographical Sourcebook. Greenwood Publishing Group, USA. ISBN 0313297851. Robins, Elizabeth, "Mischief in the Middle Ages" in: The Atlantic Monthly, v.48, n.285, July 1881, pp. 1–8. Wikimedia Commons has media related to Jesters. Look up jester or buffoon in Wiktionary, the free dictionary. Wikisource has the text of the 1911 Encyclopædia Britannica article Fool. Foolish Clothing: Depictions of Jesters and Fools in the Middle Ages and Renaissance What 14th-16th century jesters wore and carried, as seen in illustrations and museum collections.